PS I know it is April Fool’s Day, and many bloggers like to post a joke or something, but I have a major aversion to this day. Probably in direct response to how much my mom loves this day. I seriously have calendar reminders on my phone that alert me all day so that I can’t fall for her practical jokes. It works most of the time. Some day I’ll share some of the better ones with you all, but for today: our patio furniture. 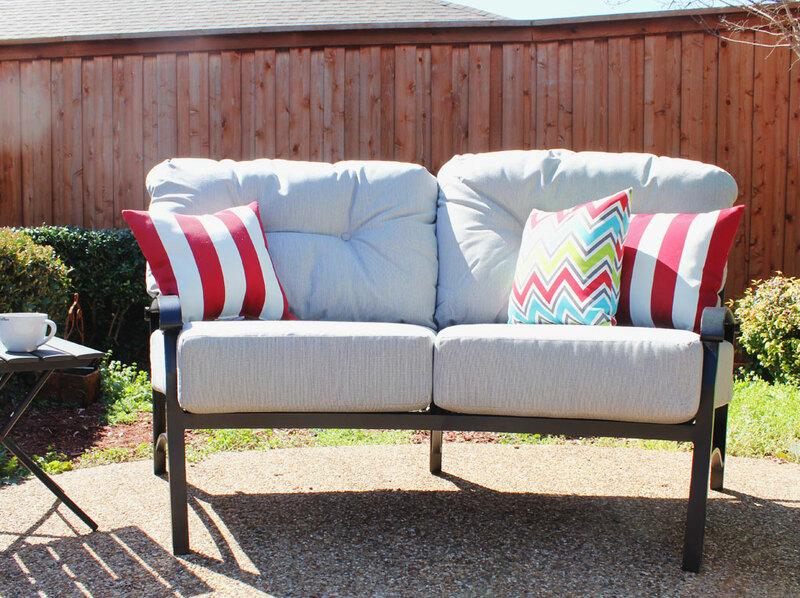 Now don’t get me wrong, those $20.00 red rocking chairs from Dillons (For you Dallas-ites… that is the same store as Kroger) served us well for 2+ years, but if we were going to spend some major time outdoors and poolside, we needed some real grown up patio furniture. Which is exactly what my mom and dad gave the husband and I for Christmas (and maybe a little birthday…outdoor furniture is not cheap!). So we went to a place over in Richardson that mom had bought her favorite outdoor glider back when they lived in Texas. I’d already scoped out Lowe’s and Home Depot, so I kind of knew what the competition was. 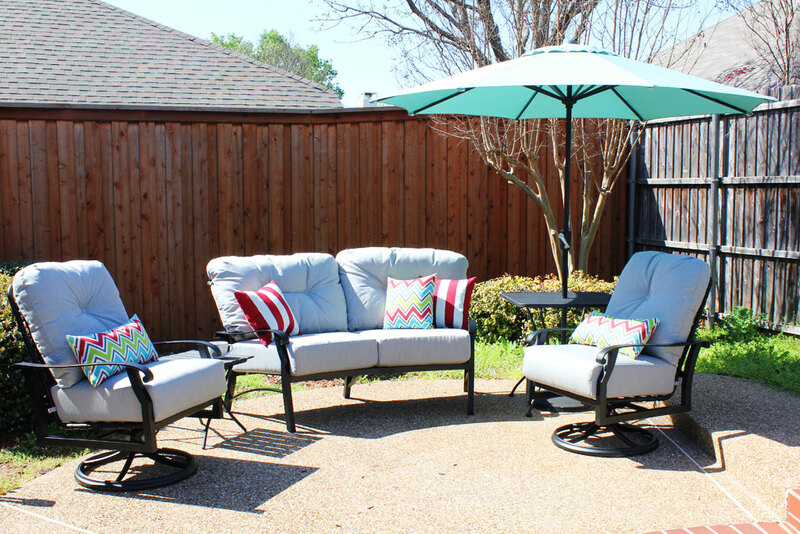 If you live in Dallas and are looking for good outdoor furniture, it is Sunnyland Outdoor Furniture and they were fantastic! I highly recommend them. All of their furniture has the Sunbrella fabric that won’t mildew or fade over time. And most of their furniture has a 15 year warranty. After looking at lots of options, I liked the look of the black and gray chairs (who is shocked I picked gray?!?!) not to mention these are hands down the most comfortable chairs and couch. Seriously, I could easily take a nap in any one of them. Plus the loveseat has a curve to it which meant it fit perfectly onto our patio, giving the maximum space out front. This set had a coffee table with it, but I didn’t love it and all the pieces sold individually, so we didn’t get it! We picked up the accent pillows and umbrella from Lowe’s. I decided against spending the extra money for the higher quality accent pieces because I want to be able to change my mind on the colors when I want to change things up. I figured the black and gray will stay nice and I can just change out pillows when I get tired of this look! The gray has a subtle pattern to it that you can kind of see in the picture above. I plan on spending the entire 9th month of my pregnancy parked right there… only getting up when I want to float in the pool. Oh and to do my day job… that pesky day job. That pesky day job! And what about that teerrrrrrible mother who gave you such an aversion to April Fool’s Day! She has a serious mean streak, or as my mother said of my grandmother, she was such a trickster. Those look so comfortable! Plus, I love those pillows! Emily you will have to come and lounge by the pool with me and check out how comfy they are!! 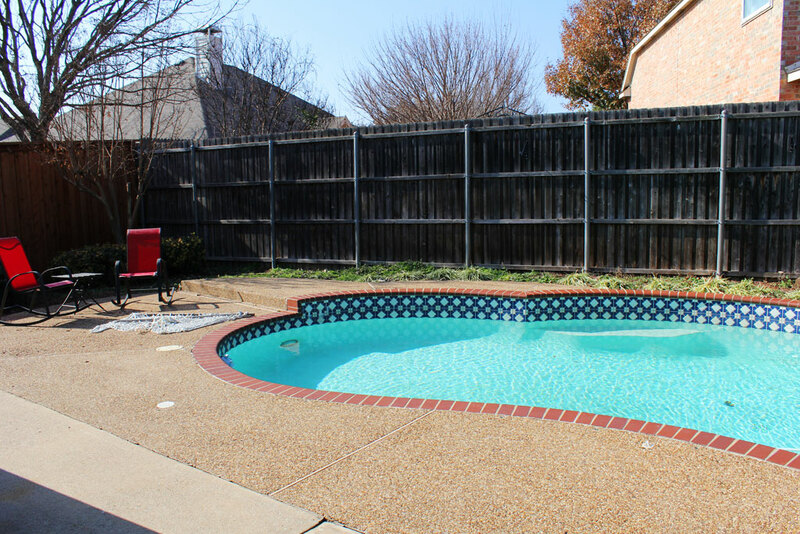 Decks and other exposed areas often sit in the elements day in day out and can quickly end up covered in many layers of grime. A regularly cleaned deck will also last longer as the process removes built up environmental contaminants that can wear away at the wood, such as acid rain and pollution.